At Cakes Plus, we make all of our cakes, cookies, and pastries to order. We bake them upon ordering, we do not freeze our products, and only the freshest ingredients are used; real eggs, real butter, cake flour and other fresh ingredients. This means our cakes not only look beautiful, but also taste delicious. Do you offer cake tastings? How long are the consultations? Is there a fee? Wedding consultations/ tastings are done by appointment to ensure our designers set aside time to discuss your options. Walk-ins are welcome, however it does not always guarantee the designers will be available to assist you. Generally we set aside about an hour for each of our consultations to ensure we give the proper attention to our brides, so it is important to arrive on time. If you may need to reschedule, or cancel, we ask you contact us no later than 48 hours in advance. Our consultations include a variety of 3 different flavors to sample for $25 (custom cake flavors are an additional fee). If the order is placed within the week of the consultation, the tasting fee is applied toward your order. During your consultation we will discuss your design, flavors, and prices. Feel free to bring any pictures, invitations, or your own ideas with you. This helps us come up with the perfect design for your event. 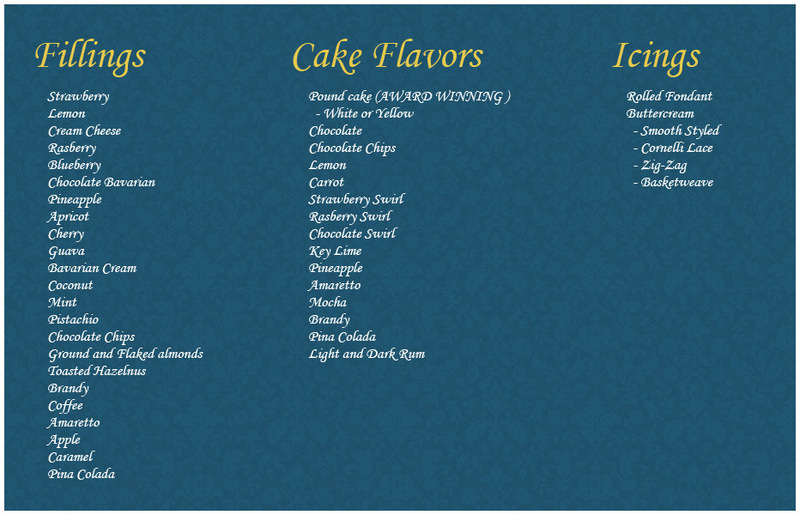 Please refer to our cake flavors and fillings on our site. Don’t see what you’re looking for? Just ask. We customize cake flavors as well. Do you make Sugar-Free Cakes? YES! We offer this flavor for any occasion as well as Sugar-Free icing and filling. What is the House Specialty Pound Cake? It’s an award winning moist pound cake with Brandy, Rum and Sherry. OUR #1 SELLER!!! No need to worry about the alcohol content, it’s baked out of the cake during the baking process. Safe for expectant mothers and children. Do you make edible sugar flowers, numbers and figurines? YES- These items are hand made out of sugar (gumpaste or pastillage), but be advised we use non-edible materials (i.e. toothpicks, wires, etc.) to hold the pieces together. Gumpaste portions are edible, but generally very hard since it is done ahead of time to allow it to dry. Orders can be done in person, via phone or e-mail. Do you make custom-made cakes? We make custom-made cakes for all occasions ranging from baby showers to weddings, including quinces, sweet sixteen’s, and bat/bar mitzvahs. We also specialize in 3D sculpted cakes. How far in advance do I need to place a cake order? Though we try to accommodate all of our customers, we recommend placing a custom cake order 2 to 3 weeks ahead of time. If you forget to place an order we always have cakes ready to go! If you are not sure of the design, you can always leave a deposit to reserve the space for your date and come back at a later time. Wedding cake/Quinces/ Sweet 16 orders are placed at an average of 6-8 months ahead of time. Sometimes we can take special occasion cake orders later than the 6-8 month period, however it is not a guarantee we will have availability if it is placed too late. Leaving a deposit to reserve your spot for your date is always recommended if you are unsure of your design. Decisions can be made at a later date. Do you have ready-made cakes? Our cases are replenished daily with ready-made cakes, mini cakes, cupcakes and cookies. These are great for a hostess gift, birthday gift, or just because you are looking to satisfy that sweet tooth! VISA, MASTERCARD, DISCOVER, AMEX and CASH. NO CHECKS ACCEPTED. A 50% non-refundable deposit is required for all orders. Any changes must be done in writing and only by the person who placed the order. No third party changes will be accepted. What is your Cancellation/ Refund Policy? A non-refundable deposit of 50% is due at the time the order is placed. The balance can be paid upon pick-up or 15 days prior to delivery of your wedding cake feeding 80 people or more or a custom 3D cake. If an order is not picked up on the date it is scheduled for, the customer is more than welcome to pick the order up the following business day. Cakes Plus will make every possible effort to reach the customer in lieu of a missed pick up. In cases of a denied pick up or delivery, the customer is responsible for full payment of the order. Cancellations must be done in writing no less than three weeks prior to the event. If done less than three weeks prior, the balance is due in full. All cancellations MUST be done in writing and only by the person who placed the order. No third party cancellations will be accepted. Upon approval of cancellation, the deposit is not refundable. If cancellation is received less than three weeks prior to the event date, the deposit and full balance are due. How much do you charge for custom or 3D sculpted cakes? Prices are based on many factors: How many people you’re having, the design you desire and the intricacy of the design. It is recommended to come in and sit down with a cake designer so they can sketch out your design and give you an exact pricing for what you’re looking for, or you can inquire information regarding your cake via our website. How much do you charge for wedding cakes? Our one of a kind wedding cakes are designed specifically to the bride’s specifications; down to the flavors. Because our cakes are made to order, we can make any flavor and any filling the bride chooses. Our best seller is our award winning house specialty pound cake consisting of brandy, rum and sherry. Our cakes are priced by the slice according to detail and design. We start off at 4.00/serving. If you have a picture or your own design of what you would like your cake to look like, feel free to bring it with you at the time of your consultation. We deliver cakes for any occasion feeding 80 people or more and special sculpted 3D cakes. Delivery is offered upon availability to Hillsborough, Pasco, Hernando and Pinellas Counties. How much do you charge for cake deliveries? Due to fluctuating fuel costs, prices for delivery and set up to your destination (upon availability) is done by the mile. Do you ship your cakes? Unfortunately, due to the type of work we do and the cake designs, shipping our cakes is not an option. We can always make the cake for your special occasion, but the responsibility of shipping is done by the customer at their own risk. Do you ship cake decorating supplies? Yes! We ship anything from colors to pre-made icings, to our sugar flowers! There is a 50.00 minimum for shipments and a 10.00 S&H fee. Actual shipping prices are applied at the time of shipment. How do I transport the cake if I pick up my order? Only air conditioning is needed unless otherwise specified. The heat or moisture will damage the sugar work and if you have color or hand painting on your cake, they may run. The cake will be fine for up to 3 days when kept in air conditioning. For deliveries, the cake should travel in your vehicle flat on the floor with the A/C on. Do not put the cake on a seat, or in the trunk due to lack of air conditioning and possible movement. Depending on the size and design, most cakes will not come in a box. A box will damage the design and detail of your cake and a box could be harder to fit in your vehicle. It is not recommended to travel with your cake on your lap. This is very unstable and with any sudden movement, the cake will be the first to be damaged. Of course! Our classes are taught by our award winning cake designers Nina and Chef Mario. Do not worry; our classes aren’t your typical cake decorating classes. Nina has learned techniques and skills used all over the world from Australia, to England, and Africa applying them to her one of a kind cakes. Due to our high volume in cake orders we do not have a set schedule for classes , however you can sign up for our preferred e-mailing list to receive class updates. Do you sell cake decorating and candy making supplies? We have a large range of decorating supplies, from already made buttercream and fondant, to food coloring, flavors, Merken’s chocolate, lollipop sticks, chocolate molds, etc. We also carry more specialized items like hand -made sugar flowers, cutters, veiners, and oil flavorings. If we do not have what you need just ask! Do you make display (dummy) cakes? We make display cakes for any occasion or event. For more information feel free to contact us using our cake inquiry section of our site. If I give you a picture can you make an edible image of it for my cake, cookie, or cupcake order? We can make edible images of corporate logos, pictures or images.